I was one of 26 contributors invited to produce a celebratory portfolio of creative typographic works to mark the 150th anniversary of the birth of American Type Designer Frederic W. Goudy. I wanted my piece to reflect the high regard and esteem in which Goudy is held while at the same time playing with type in an unorthodox way. 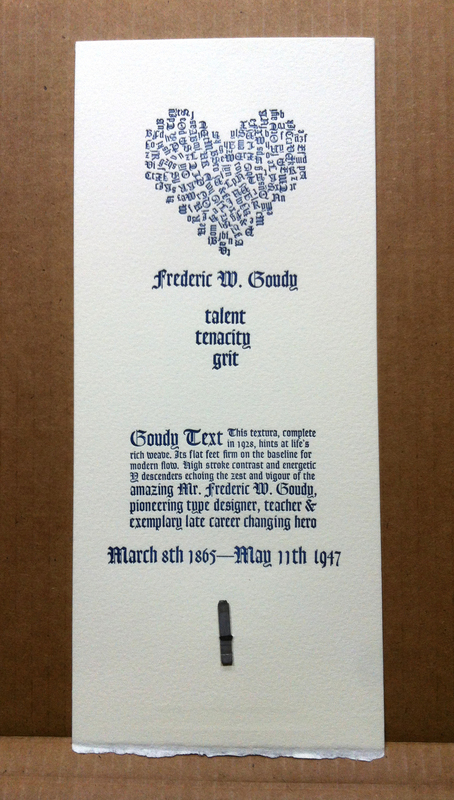 I hand set a heart in Goudy Text along with anniversary specific text and my own short celebratory commentary on some of the character traits of both the typeface and the man. Working with limited quantities of type forced me to redraft and refine the body text several times. I worked a change of point size into the piece, the switch occuring at the point the content changes from speaking of the Goudy Text typeface to celebrating the long and varied career of its creator. I hand cut the paper to have one deckle edge at the bottom and included a tiny colophon on the reverse. 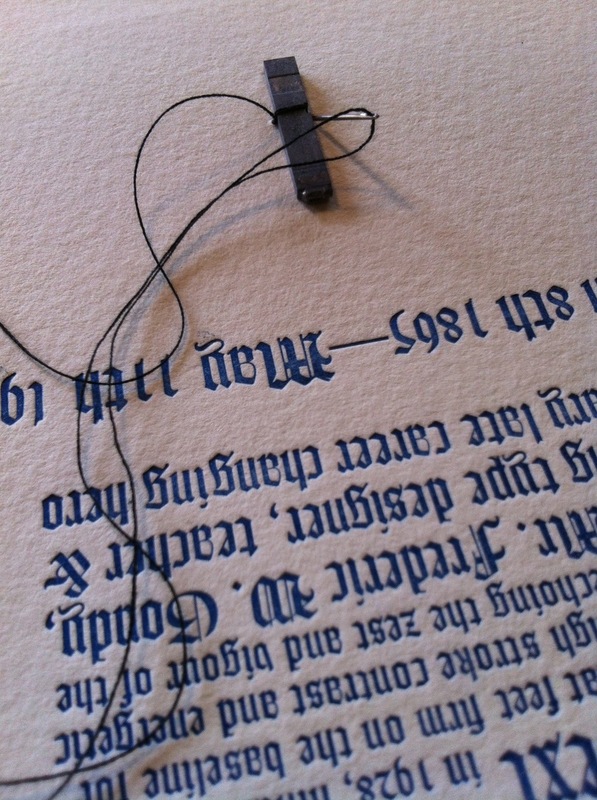 After printing I hand finished each one by stitching a single sort of Goudy Text metal type onto the bottom of the broadsheet. Each contributor recieved a portfolio to coincide with the Goudy 150th anniversary exhibition at the RIT Cary Graphic Arts Collection in Rochester, New York. 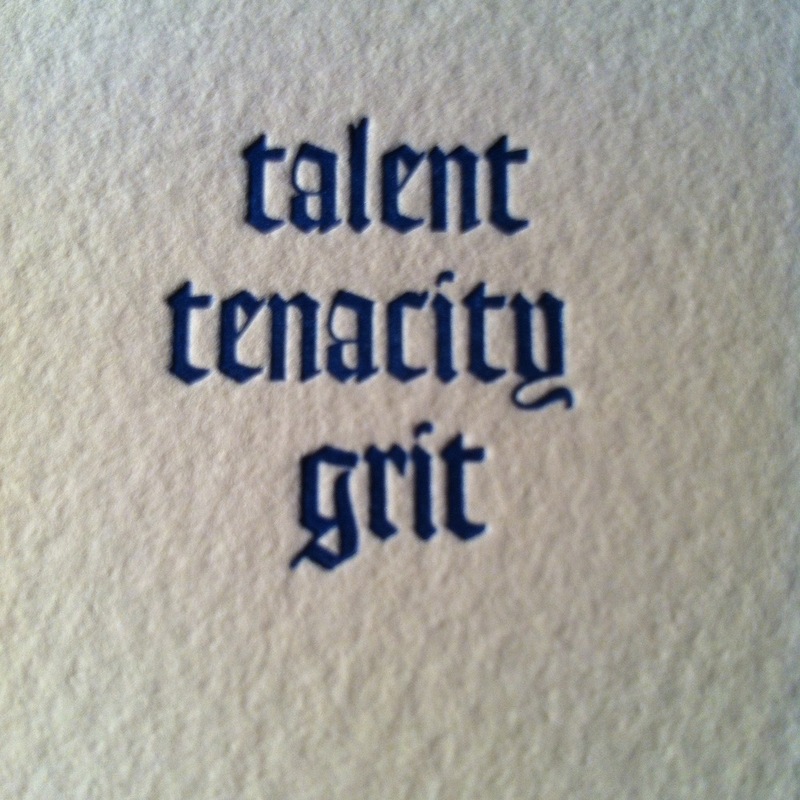 Each and every piece celebrating the typography and spirit and individuality of an amazing man. Portfolios were also sent to: The library of Congress in Washington, The Grolier Club in New York, The Newberry Library in Chicago and Syracuse University Library.